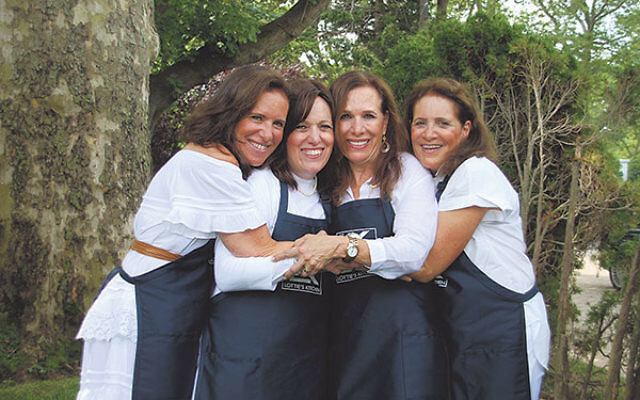 The four daughters of Lottie and Haim Chalom, from left, Claudia Bilderici, Linda Dayan, Nina Cohen, and Susan Menashe. When Joe and Frieda Franco of Deal host a party, they don’t mess around. Some 2,000 guests descended on the Franco household July 7 for an all-day event intended to raise $100,000 for Lottie’s Kitchen, the Israel-based division of Ezer Mizion that focuses on food distribution to individuals and families in need. Scores of volunteers and a cadre of 17 valet parking attendants also were on hand to handle the overflow crowd. This was the 14th annual benefit on behalf of Lottie’s Kitchen, which provides over 80,000 meals, 83,000 sandwiches, and 13,000 cookies and cakes every year for Jerusalem-based families dealing with serious illnesses. Recipients include family members staying with hospitalized patients, families with a sick or disabled parent, victims of terror and their families, and the sick and the homebound. 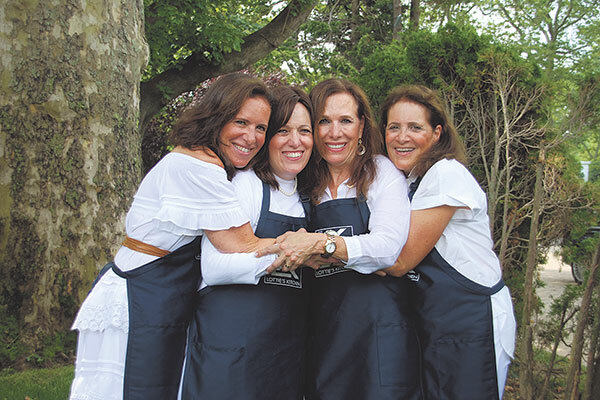 By comparison with Ezer Mizion, Lottie’s Kitchen is a young organization, launched in 2003 when the four Brooklyn-born daughters of Haim and Lottie Chalom wanted to honor their recently deceased parents. Three of the daughters — Claudia Bilderici, Nina Cohen, and Susan Menashe — live in Deal, and one, Linda Dayan, has been a resident of Israel for close to 40 years. Dayan told NJJN via e-mail, “Her favorite thing was doing hesed with food. Anyone who came into the house would get a serving of whatever was cooking. Not only her friends, but any repairman or neighbor.” Actually, they didn’t even have to walk in, according to Dayan. The mailman and the garbage man also got a taste from her kitchen on a regular basis. “When our mother passed away, we were already familiar with Ezer Mizion. We knew that we wanted to do something within this amazing organization! And we knew it had to be connected to food,” said Dayan. The kitchen facility being used at that time by the organization was not in good shape, she explained. The daughters determined to raise enough money so that it could be renovated and named Lottie’s Kitchen. On the Ezer Mizion website — ezermizion.org/blog/tag/lotties-kitchen/ — Lottie’s Kitchen is described as a “circle of giving.” In numerous stories about real people, the organization is seen as both giver and receiver. One tale traces the experience of an ordinary happy family until their child was diagnosed with terminal cancer. Contacted by a neighbor, Lottie’s Kitchen volunteers appeared on the scene, providing comfort, compassion, and food. When the youngster died, her mother, working her way through grief, became a volunteer, peeling and slicing in the kitchen and “lovingly” wrapping and delivering meals to others. All four of Lottie’s daughters played major roles in the annual Lottie’s Kitchen celebration and fund-raiser — the exact amount raised was undetermined at press time. At the Franco home on July 7, Cohen, whose husband Sam is the mayor of Deal, served as a sort of major domo, organizing the event, which included the following elements: a series of cooking demonstrations, a raffle, a bake sale, a Chinese auction, a kitchen boutique featuring hundreds of items, and an area where home recipes could be sampled and purchased. Menashe, an accomplished photographer, offered portrait sittings for four hours on July 6, and added another two hours on the 7th, from 9 to 11 a.m.
Bilderici and Dayan were visible throughout the day, greeting guests, touting merchandise, assisting at every turn.